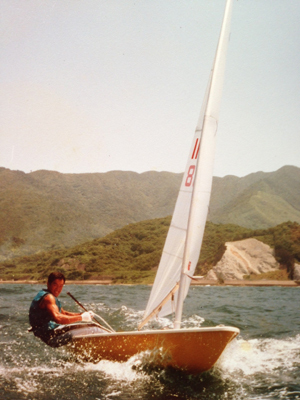 The Story Thus Far | PRODUCTS | Naito Kogyosho Co., Ltd.
President Naito began laser-class sailing while in university and later built a clubhouse in his hometown of Yamaguchi to promote the culture of sailing. In 1985, he and five kindred spirits founded the "Cape House" yacht club. Over the years, the yacht club has steadily grown and there are now over 30 members. 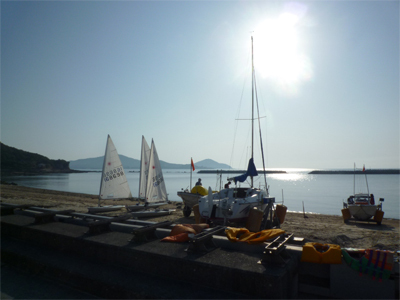 In participating in the Japan Championships and hosting their monthly Fleet Race, the club decided to purchase a motorboat for rescues and emergencies. At the time, the yacht club's powerboat was docked at the nearby fishing port that was 10 minutes by car. Because it would take over 20 minutes for the motorboat to be dispatched to the clubhouse, their powerboat was not readily available on demand. In the back of his mind, President Naito entertained the lingering thought about how convenient it would be if they could simply embark their motorboat directly from the beach. It also bothered him that the powerboat docked in the water required extra maintenance and that they frequently had to remove seaweed and shells from the bottom of the boat. The club members would waste nearly an hour just taking the boat to a marina with sufficient maintenance facilities. A strong typhoon hit Yamaguchi Prefecture in the summer of 1999 and the motorboat docked at the fishing port capsized and sunk. As such, the yacht club had to buy a new motorboat. Members of the yacht club built a makeshift boat launcher using old tires to maintain and clean the bottom of the boat that was used until 2002. The difficult process required a few of the club members to wade waist-deep out into the water. Carrying the makeshift trailer with them until they were about a meter deep, they would slip the trailer under the 23-foot boat. 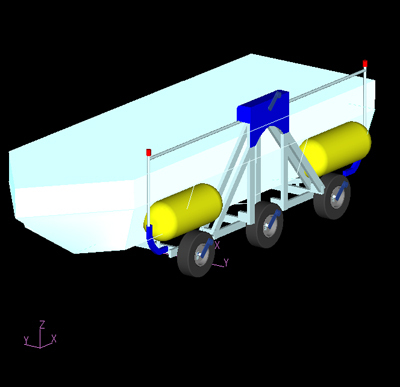 A rope would then be attached from the trailer to a four-wheeled vehicle to drag the boat ashore. Strong winds and currents would aggravate the situation, making the moving boat even harder to dock with the trailer. It was around this time that President Naito finally realized while he was steering the boat that "Hey! Why not just dock with the boat while out on the water and drive that ashore?" This was the birth of the Floader concept. Starting from scratch, President Naito began sketching drawings of a contraption with a powertrain to drive it, require little maintenance, and would be economical to produce. Being a member of the Inter-Industry Collaborative Committee: Research for the Conservation of Labor in Construction and Civil Engineering, he proposed the idea in the fall of 2002. With a great deal of effort by the research committee, Floader No.1 was added to the yacht club's facilities. For the past twelve years, the yacht club has relied on Floader No. 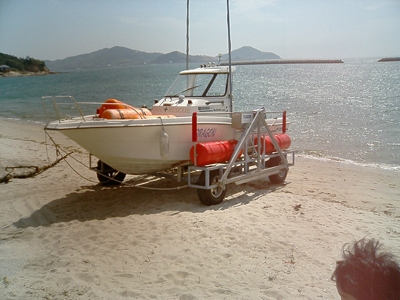 1 to provide easy access to the ocean for its rescue boat.